Two books from my childhood come to mind. "Christmas just isn't Christmas without any presents." When I was little, my grandmother on my father's side lived all the way over in British Columbia. Every couple of years she'd come for a visit and stay a few weeks in the summer. She'd always bring us something. One year it was a book: Heidi. It was a little harder book than I was used to but I enjoyed reading about Heidi, her grandfather and the goats. Of course, that my grandmother gave it to me is why it is such a special gift. The fact that I still have these books as an adult and that they've survived several moves, shows how much these gifts mean to me. I'm quite sentimental. Beautiful memories, and both of your titles are classics! Happy Booking Through Thursday. I have a book giveaway going on; check out my sidebar if you're interested. I love reading everyone's memories. So lovely! I love Little Women, it is such a lovely book, especially at Christmas time. Happy BTT! I can't remember a particular book, since I always got a book from Santa or on my birthday. And I would then curl up somewhere and read read read until I was finished! I agree with Yvonne, I love reading everyone's memories too. I LOVE Heidi, it's an awesome book. My BTT isn't as special as yours. That is an awesome story and you can feel the warmth of your love of both your grandmother and the books. 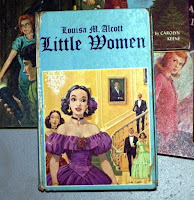 Little Women is one of my favourite books! Although I didn't receive my copy as a gift, I'm hoping it'll last forever and ever..
What wonderful memories! And how lucky you are to still have those lovely books. There are a few I treasured from my childhood that must have been misplaced through the years. I have my grandmother's copy of Little Women from when she was a girl. It's such a great book and I can't wait to keep passing it down to my future kids.